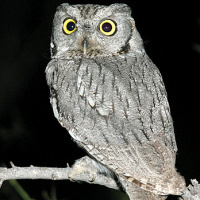 The Western Screech Owl is a small, nocturnal woodland Owl with short ear-tufts and yellow eyes. A grey and a less common brown morph are known to exist. The species name kennicotti was created to honour Robert Kennicott, an American explorer and naturalist (1835-1866). 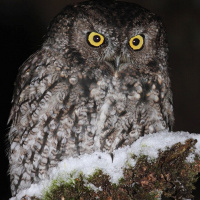 Originally, this bird was officially called Kennicott's Owl. Typical call (bouncing) - Silver Creek, Arizona, USA. August 2014. CC Dan Lane. Double trill - San Gabriel Mountains, California, USA. May 2015. CC Lance A. M. Benner. Description: Grey morph: The facial disc is pale brownish-grey, finely mottled and vermiculated darker. The rim is dark and not very prominent, with pale speckles on the edge. The eyebrows are slightly paler than the surrounding plumage, so are not very prominent. The eyes are bright yellow, the bill and cere blackish. There are blackish bristles at the base of the bill. Ear-tufts are short and pointed, and prominent when erected. 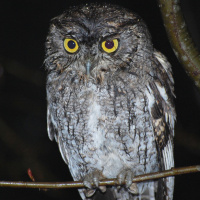 The crown and upperparts are brownish-grey with blackish shaft-streaks and fine vermiculations. The scapulars have whitish outer webs, edged black, forming a line of white spots across each shoulder. Flight feathers are boldly barred light and dark, while the tail is less distinctly barred. Underparts are paler than the upperparts, with blackish shaft-streaks and irregular cross-barring. The upper breast has some broad shaft-streaks resembling black spots. Tarsi are feathered to the base of the toes, which are greyish-brown in colour and bristled and partly feathered. Claws are blackish-horn. Brown morph: Similar in pattern but with a more rufous-brown general colouration. Size: Length 22-24cm. Wing length 142-190mm. Weight 90-250g. Females are larger than males. 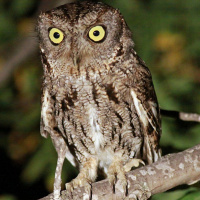 Habits: Nocturnal, with activity generally beginning 20-30 minutes after sunset. Flight is noiseless with soft wingbeats and gliding. Will become motionless if disturbed at roost. 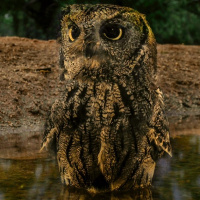 This owl is very aggressive when defending a nest site, and may attack humans. 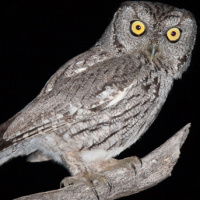 During direct flight, the Western Screech Owl flies fairly rapidly with a steady wing beat of about 5 strokes/second. It rarely glides or hovers, but may fly bat-like with erratic movements, when maneuvering through wooded areas. Wings are broad and the head is held tucked in giving a flying bird a stubby appearance. Voice: The male's most common call is a mellow, muted trill "hoo-hoo-hoo...", or bouncing ball song, that speeds up at the end, but maintains a constant pitch. It is given by the male during the mating and nesting seasons, but also during the autumn and winter. This call is primarily territorial in nature. A secondary song is a double trill of rapid bursts. Other calls are a soft "cr-r-oo-oo-oo-oo" given as a greeting call, and a sharp bark given when excited. Hunting & Food: Hunts mainly from a perch in open woodlands, along the edges of open fields or wetlands, or makes short forays into open fields. They also capture flying insects on the wing. 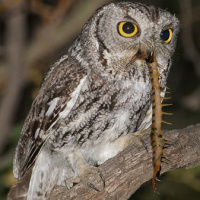 Small prey is usually swallowed whole on the spot, while larger prey is carried in the bill to a perch and then torn apart. An extremely wide range of prey species is captured. The most favoured prey are small microtine rodents and deer mice, larger insects, or small birds depending on abundance. Pellets are medium-sized, averaging about 38 by 19mm. Breeding: In late February, or earlier in the South, males begin to sing at dusk, moving around their territory and singing from different perches. During courtship, males and females call to each other in a duet as they approach each other. When together they preen each other's heads and nibble at the other's beaks. The male then changes his call to a rapid tremolo, answered with a short, tremolo from the female. 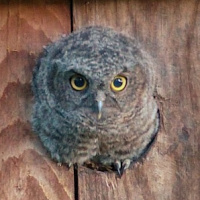 Western Screech Owls nest almost exclusively in tree cavities. Enlarged natural cavities are preferred but they will also use old Pileated Woodpecker and rotted-out Northern Flicker holes. Nest cavities are usually 2 to 6 metres above the ground, but may be up to 15 metres up. They will readily nest in suitable nest boxes. 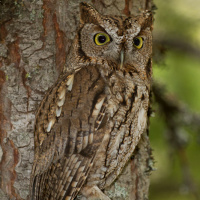 Nests are almost always in deciduous trees such as oaks, cottonwoods, maples, sycamores and large willows, but also in large cacti, Douglas-fir snags, and junipers. One subspecies in Arizona nests exclusively in saguaro cacti. 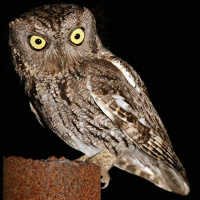 No nest material is added and nests are kept cleaner than in Eastern Screech Owls. 2 to 5 (average 3-4) eggs are laid on natural sawdust on the floor of the cavity. The average clutch size tends to increase from south to north and from the coast inland. The eggs are laid every 1 to 2 days and incubation begins after laying of the first. The incubation period is about 26 days and the fledging period about 35 days. 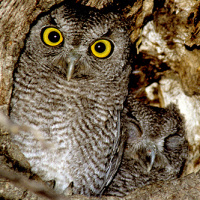 Females incubate eggs and brood young while males bring food to the nest. 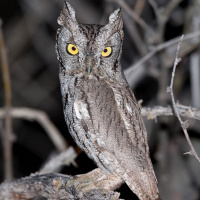 The Western Screech Owl is single brooded, but may re-nest if first clutch is lost. Pairs will often reuse nest sites in consecutive years. Pairs mate for life but will accept a new mate if the previous mate is lost. gray and red colour phases will mate together. Adults tend to remain near their breeding areas year-round while juveniles disperse in the autumn. Small territories around nest sites are vigorously defended by males. 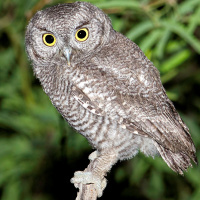 In desert riparian areas of the southwest, where these Owls can be quite numerous, territories may be only 50 meters apart. Home ranges are much larger, and range from 3 to 60 hectares, but these are not defended and there is much overlap between pairs. 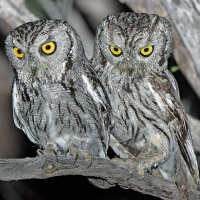 Habitat: Western Screech Owls inhabit a wide variety of habitats. On the northwest coast, they inhabits humid Douglas-fir, western hemlock, western red cedar, and Sitka spruce forests along the edges of clearings, rivers, and lakes. Further inland they occupy a narrow ecological niche of lowland deciduous forests, especially riparian woodlands along river bottoms. Southern populations inhabit lowland riparian forests, oak-filled arroyos, desert saguaro and cardon cacti stands, Joshua tree and mesquite groves, and open pine and pinyon-juniper forests. They avoid dense forests because Great Horned Owls use that habitat, and high elevation forests. In general, they require open forests, with an abundance of small mammals and insect prey, and cavities for nesting. They roost mainly in natural or woodpecker cavities in large trees, but also in dense foliage of deciduous trees, usually on a branch next to the trunk, or in dense conifers. 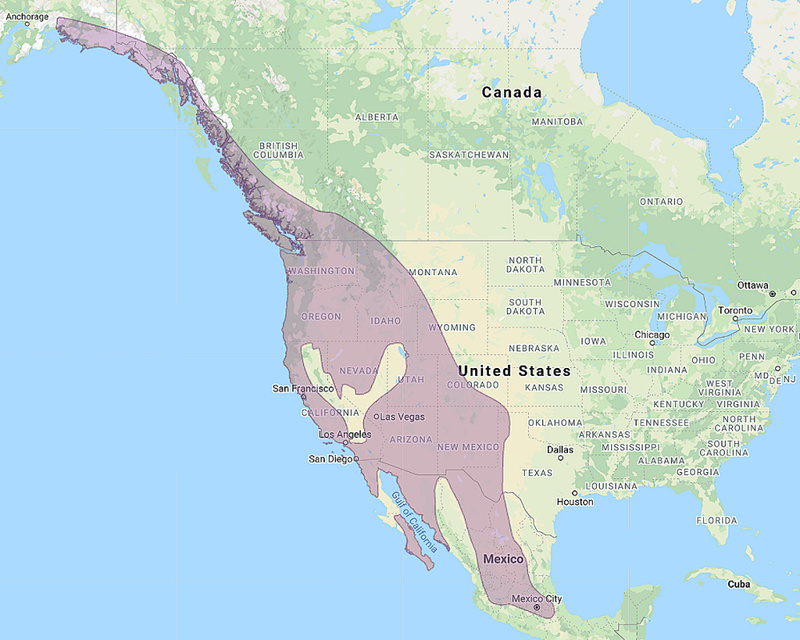 Distribution: Western North America from northern Canada and Alaska to central Mexico. Original Description: Elliot, Daniel Giraud. 1867. Proceedings of the Academy of Natural Science of Philadelphia, 19, p. 99-100. Page by Deane Lewis. Last updated 2018-01-08.